Commercial Travellers connected with the house of Rylands & Sons, appears to have been Cassidy's source material. John Rylands, born near St Helens, Lancashire in 1801, was a wealthy cotton merchant and mill-owner. He was the third son of Joseph Rylands, a manufacturer of cotton goods and his wife Elizabeth (née Pilkington). He was educated at the St Helens Grammar School. His aptitude for trade quickly became obvious and manifested itself early and, before the age of eighteen, he entered into partnership with his elder brothers Joseph and Richard. Their father joined them in 1819, when the firm of Rylands & Sons was established. The firm, which had a capital of £2 million, became the largest textile manufacturing concern in the UK. Manchester's first multi-millionaire, he employed 15,000 people in his 17 mills and factories. John Rylands died on 14 December 1888 at his home, Longford Hall in Stretford, leaving his widow Enriqueta a fortune of over two million pounds. She determined to spend much of the money on a library to commemorate her husband and perpetuate his name, which it has done very successfully. The Library in Edwardian times. 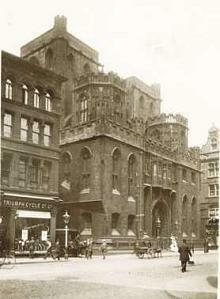 The building to the left, which included a bicycle shop, was demolished c.1950s. 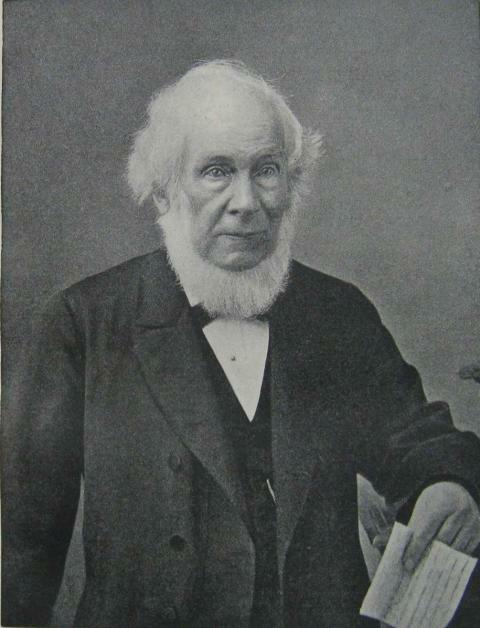 D. A. Farnie, John Rylands of Manchester. Bulletin of the John Rylands University Library, 75(2):2-103. (1993). Available online through Manchester eScholar. Although the statues appear to match, they were not conceived or commissioned together. John Rylands was commissioned by Mrs Rylands in 1894 as an integral part of the library dedicated to her late husband, and has had pride of place since the building opened in 1900, whilst her own likeness was commissioned by supporters of the Library, and unveiled in December 1907, a few months before her death in 1908. 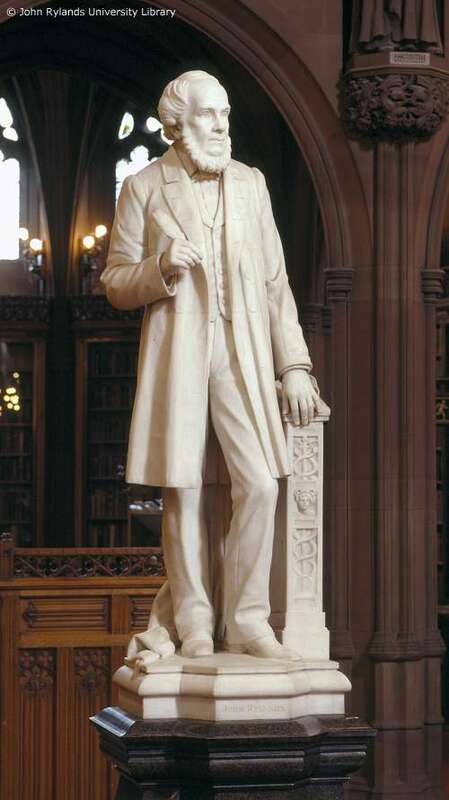 Mrs Rylands is said to have originally envisaged a bust of her husband, to be located in the apse at the end of the library reading room, but later changed her mind and commissioned Cassidy to create a full-length statue: he quoted a price of £1,325, the work to be complete in 15 months. The price would have included the not inconsiderable cost of buying a block of marble and having it transported from Italy. As is customary, a small plaster model was made for approval and amendment, and there was much discussion about the exact location of the statue, which brought forward out of the apse into the main space of the reading room, where it could be better seen and illuminated. It was installed in 1899, on a granite plinth supplied by Patteson's, a Manchester firm of monumental masons at a cost of £100. John Rylands, photographed in 1887. Written by Charlie Hulme. Updated February 2013.